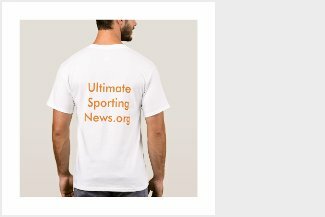 Nolan Arenado homered twice, drove in a career-high seven runs and finished a triple shy of the cycle, Carlos Gonzalez fell a homer short of a cycle, and the Rockies set a club record with four triples -- two by rookie shortstop Trevor Story -- in a 10-6 victory over the Giants at Coors Field on Wednesday night. Arenado knocked a two-run homer off Jake Peavy (0-1) in the third inning, and a three-run shot off Josh Osich in the eighth. 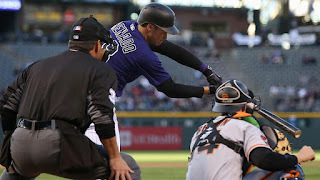 Arenado's RBIs fell one shy of the club's record of eight, shared by Andres Galarraga against the Dodgers June 27, 1996; Larry Walker against the Cardinals April 28, 1999; Ronnie Belliard against the D-backs Sept. 23, 2003; and Matt Holliday against the Padres on Sept. 20, 2005. The Rockies had 18 hits and cracked a club record-tying 12 extra-base hits, last achieved July 30, 2010 against the Cubs. Peavy gave up 10 extra-base hits, a record for a San Francisco pitcher. Charlie Blackmon tripled to lead off the bottom of the first, Gonzalez tripled later in the inning and Story hit triples in the fourth off Peavy and the sixth off Chris Heston. 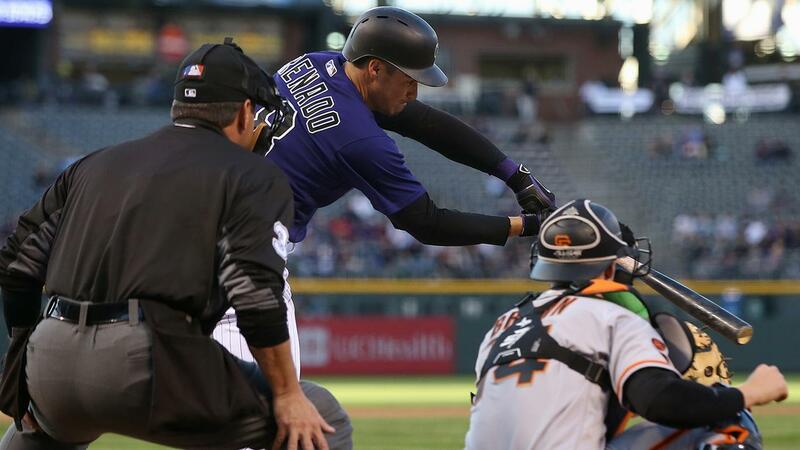 "We had quality at-bats, and we got 'Peav' out early," Arenado said. "He was not comfortable. He's tough. He gets fired up out there. I have a lot of respect for him. I have a lot of respect for all their pitchers." Rockies starter Jordan Lyles nearly coughed up the early lead and left ahead, 6-5, after 4 2/3 innings. But lefty Chris Rusin (1-0) struck out three in 2 1/3 perfect innings. The Giants'Brandon Belt homered off Miguel Castro in the eighth -- just the second hit and first run in Castro's five appearances this season -- to cut the difference to 7-6. But Arenado's second homer provided a comfortable margin. "We played some nice offense tonight," Rockies manager Walt Weiss said. "Our approach was really good, especially after a tough night. We had some great at-bats with two outs." The Giants have homered in each of their nine games -- a club record. The Rockies have 19 homers to the Giants' 18. Triple threat: The tone was set in the first inning for Peavy, who struggled to execute and couldn't put away hitters and end innings when he needed to. The Rockies got three extra base hits in the first inning, but put two runs on the board and signaling a relentless, record-breaking attack. The big strikeout: A game in which a team has as many extra-base hits as the Rockies usually doesn't come to a pitcher coming through, but this is Coors. After Hunter Pence's two-out RBI single off Lyles in the fourth cut the difference to 6-5, Rusin entered and fanned Belt. The Rockies would say a step ahead of the Giants. "I was just preparing for Belt in the bullpen, and I was able to get him out," Rusin said. "It's always good when you're a reliever and you come in and stop the momentum from the other team and put up zeroes. You keep our offense in the game, you see what happens." Horseshoes and handgrenades: San Francisco rallied once to tie the game in the third and posted a three run rally against Lyles to come within one in the fifth. Angel Pagan led off with an infield single to second and scored on Trevor Brown's double to left. Brown moved to third on a groundout by pinch-hitter Gregor Blanco, and after Denard Span walked, Brown scored on a sacrifice fly from Joe Panik. Pence plated Span, and the Rockies went to their bullpen, bringing in Rusin to face cleanup hitter Belt, who ended the inning with a swing and a miss, a run shy of a tie ball game. Get fired up: You never have to wonder about Arenado's emotions. He was especially demonstrative with his teammates in the dugout after his second homer, which came with the Rockies clinging to a one-run advantage. "It's frustrating, but I know it's there. I've just got to do a better job that third or fourth time through the lineup." -- Rockies starter Lyles, who was rolling early but couldn't get through the fifth. It was his second short start in as many this season. "This is a tough place to take the pitchers out early," Giants manager Bruce Bochy said of Peavy's outing. "I stayed with him there. We got within a run. The guys did battle back. It is confidence in the offense. I was hooping to get at least four or five out of Jake." Peavy allowed 10 extra-base hits (six doubles, three triples, one home run). He is only the third big league pitcher to allow 10 or more extra-base hits in the last 50 years. Boston's Curt Schilling did it on Aug. 10, 2006 at Kansas City and Cleveland's Luis Tiant endured 10 extra-base hits on April 18, 1969 vs. Boston. The Major League record for the most extra-base hits allowed is 16 by George Derby of the Buffalo Bisons on July 3, 1883. Blackmon was the first player to hit a ball off the newly elevated right field fences in front of the Rockies bullpen at Coors Field. The fences were raised 8 feet and 9 inches during the offseason, making the total height 16 feet 6 inches. Blackmon drilled a Peavy offering into the right-center gap and hit the fence on a bounce. Without the fence, the ball would have landed in the bullpen for a ground-rule double. Instead, the drive remained in play and Blackmon landed at third with a triple. He scored when the next batter, Story, lofted a sacrifice fly to right. The fencing wasn't as kind to Story. He hit two balls to the deepest part of the park, just right of center, and had them blocked by the new fencing. They ended up two of the team single-game record four triples, but could have lifted Story's home run total -- currently seven, in his first eight Major League games. Giants: Matt Cain climbs the hill Thursday at 12:10 PT in the series finale for the Giants. The left-hander has had good success at Coors Field, posting a 6-3 record with a 4.45 ERA in 89 innings over 15 career appearances. He earned a no-decision in his first start of the season, a six-inning, two-run affair the Giants eventually won in walk-off fashion. Rockies: Lefty Jorge De La Rosa (0-1, 12.46 ERA) has struggled, but the Rockies, believing he will get going, juggled the rotation to have him start on four days' rest in the series finale with the Giants at 1:10 p.m. MT.